For preparing premium cakes, the Parfait cream is a fantastic choice. 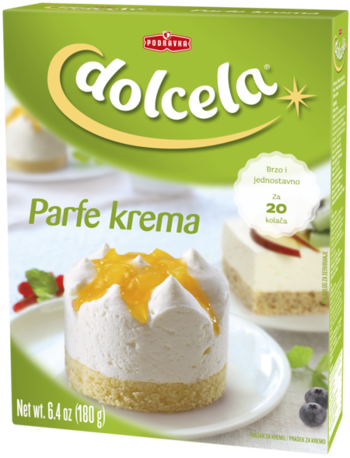 Toilsome preparation, often unsuccessful is today made easy with Dolcela PARFAIT CREAM so even the most demanding desserts always turn out well and simple to prepare and their taste and attractive appearance suitable for even the most precious occasions. A light vanilla flavour cream is mainly a carbohydrate product containing milk proteins and plant fats. Contains solely natural colours. Preparation: Empty the bag contents in 6 dl cold milk. Stir gently and mix with an electric mixer for 4 minutes (maximum speed). Put the cream on the surface of the cake immedeatelly, shape and leave in the refrigerator for one hour. Decorate as desired. Ingredients: sugar, skimmed milk powder, edible gelatin, hydrogenated vegetable fat (coconut, palm), glucose syrup, modified starch, emulsifier (E 472a), milk proteins, color (beta-carotene, paprika extract). May contain wheat and eggs.